CABOT — When we arrived a few minutes early for a tour of the Cabot Creamery cheese factory here, we were directed to the back room, armed with toothpicks and napkins, and turned loose on bowls of cheese morsels. We started with the Mild cheddar and worked our way up to Seriously Sharp and Vintage before our tour was called. The assorted dips and flavored cheddars such as horseradish, sage, chipotle, or smoky bacon would have to wait. Cabot is the largest of the 41 members of the Vermont Cheese Council. Predictably enough, the tour begins with a short video that recounts the origin of the Cabot Cooperative, formed in 1919 when 94 farmers each chipped in a cord of wood and $5 per cow to buy out the Cabot village creamery. This Cabot plant (one of three and the only one open for tours) produces the company’s cultured milk products as well as the flavored cheddars and cheddar wheels. The short walk through the modern facility — viewed through large windows — is great for fact-mongers. We learned that the facility can store 1 million pounds of milk, that it makes 43 tons of cheddar a day at full production, and that each pound of cheese requires 10 pounds of milk. We also learned that nowadays roughly 1,200 farms in New England and upstate New York belong to the cooperative. A few of them operate B&Bs, making it possible to slide into a farm family’s life for a day or so to get a real appreciation of where that cheese begins. In all, there are seven bedrooms and four bathrooms for guests, though when the house isn’t full Beth tends to spread people out to minimize sharing. Like the family, guests leave their shoes on the front porch before coming inside. The porch also holds a wide assortment of gum boots in adult and children’s sizes to wear while exploring the barns or mucking around the calf pens. Bob works the farm with grown sons Tom and David and a few hired hands. Although they gladly pause in their chores to talk amiably or answer a question, they are usually busy from before sunup until long after sundown. The main farm consists of 125 acres with a mile of frontage on the White River, but the Kennetts also have 96 acres with a barn for heifers and young cows, and a 40-acre parcel in a land trust where they grow feed crops for the cattle. In all, the farm has about 270 registered Holsteins, including 110 milking head. 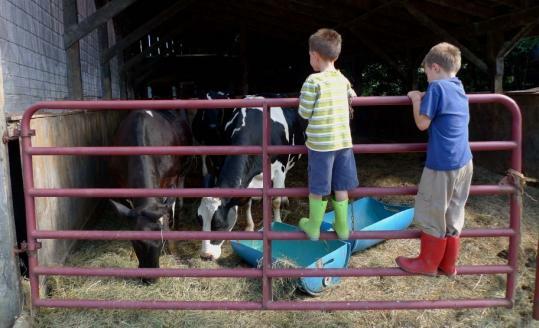 The farmers may be too busy to serve as tour guides, but there’s almost always a young guest eager to share his or her newfound expertise about farm life. We were admiring the young goats in a pen near the tractor barn when Henry Ferrelli, 7, of Tampa, Fla., offered to show us the cow barn. His brother Johnny, 5, tagged along to provide color commentary. The Ferrellis had been staying at Liberty Hill for several nights, and both boys had their routine down pat, showing us where the cows came in to feed and where they stood for milking. Henry was particularly impressed with the manure removal system, which washed the cow flops down a channel and onto a conveyer belt that delivered them to the manure pile downhill (and downwind) from most of the rest of the farm. But he also appreciated the dramatic efficiency of the milking system, showing us how the warm milk traveled through tubing and sprayed through a glass cylinder on its way to the storage tank. That milk is picked up by a Cabot truck every morning before dawn. Given how early the day starts, it’s no surprise that dinner is served at 6 p.m. Beth called us all to the long dining table where she had laid out the meal family style. She took one of two seats at the head of the table, and gathered us to say grace. Then we spent several minutes passing around the platters and bowls of turkey, raspberry rhubarb sauce, mashed potatoes, gravy, peas, pineapple stuffing, pumpkin rolls, and salad with two kinds of homemade dressing. Later, she brought out a rhubarb cake and fresh-churned raspberry ice cream for dessert. Bob never took his place beside Beth, but a plate awaited him, staying warm on top of the stove. After dinner, the adults relaxed in the porch rockers and in chairs on the lawn as the children took turns on a tire swing hung from a sturdy limb of an oak. Peanut, a gray tabby barn cat, chased dragonflies on the lawn as evening descended into dusk. Across the road, the young calves stirred in their pens. Nonetheless, they managed to stay awake until about 9 p.m. when Bob and Beth came out to do the last feeding of the calves, including an almost newborn calf that had been a month premature. Katie, Zoe, and Rhys crowded around to help feed it with a bottle. Even when the calves were fed and most guests had wandered toward their rooms, the day was not over for Bob and Beth. “If we’re lucky, we’ll finish up in the barn by 10 or 10:30,’’ she said. Late night or not, Beth managed to lay out a serious farm breakfast by 8 a.m. Guests are not expected to do chores on the farm, but we were considering that we might have to toss some bales of hay or chop some silage if we ate so well every day. Beth’s spread included both blueberry and plain buttermilk pancakes with local maple syrup. (The buttermilk, she explained, was Hood, since Cabot doesn’t make the product.) She also set out a blueberry cream cheese coffee cake and a delicious breakfast casserole. When guests complimented her, she named the farmers from whom she had bought the eggs and vegetables. Cabot Visitors Center 2878 Main St.
Daily 9 a.m.-5 p.m. June-October; Mon-Sat 9-4 November, December, and February-May; Mon-Sat 10-4 in January. Tours $2. Lodging with breakfast and dinner: adults $98, teenagers $75, children ages 2-12 $54.